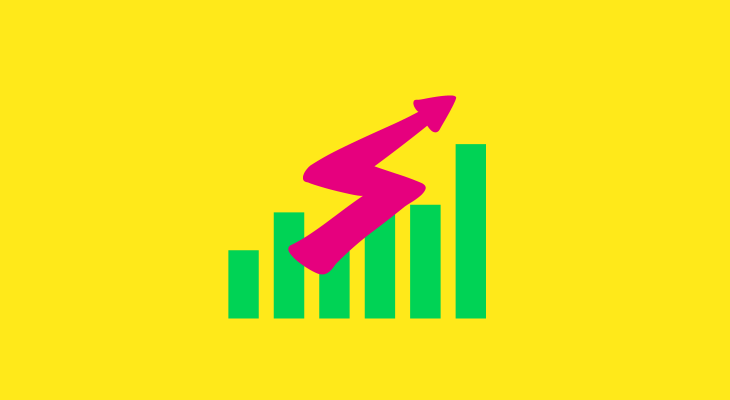 Right now we are in a freelancing boom that many experts believe will continue. With a staggering 53 million Americans that would be categorized as freelancers and almost 30% of those doing it in tandem with their main profession. 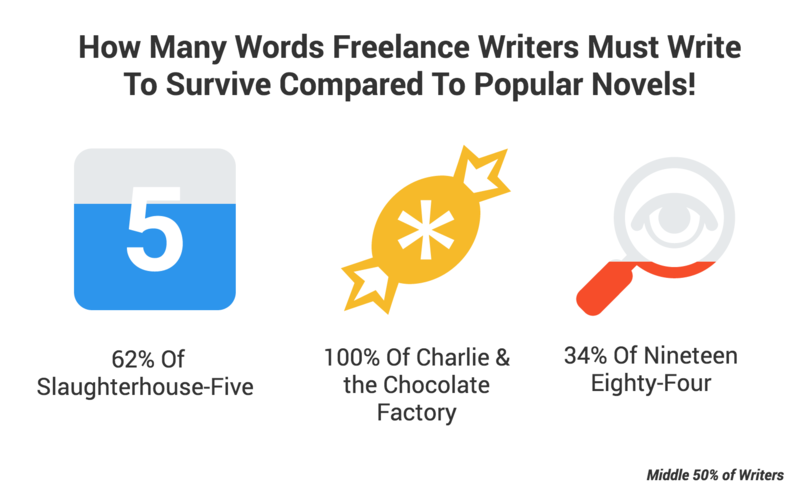 Although there are no concrete numbers on how many are actually freelance writers, the estimates are pretty high. A simple search on either UpWork, Scriptd or Fiverr brings up hundreds of thousands of freelance writers. UpWork boasts 600k+ writers available for hire! But can you survive as a full-time freelance writer in 2016? How much content do writers need to create in 1 month in order to survive in the U.S.? 3. Select the publication level buttons below to get a more accurate breakdown of your required word count. One of the things that stuck with me was how wildly the pay varied between publications. Some of the most well known publications would pay in exposure, hoping to find new and eager writers like myself. But some of the other small or niche sites and publications would pay extremely well. Back when I was a new writer and even now, it makes no sense to me! 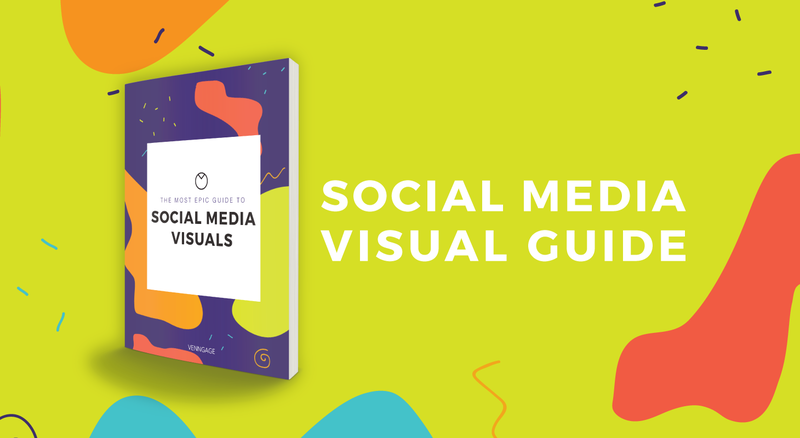 And after finding this goldmine of data that outlined some interesting trends, I knew we had to dig deeper. So I did and got lost in it like the Forbidden Forest. 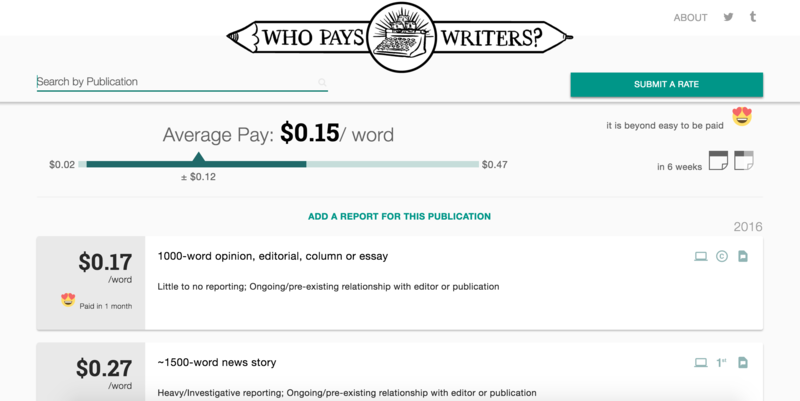 To make this article a little easier to follow, I have decided to break it into two parts: the first part will strictly report on our findings after looking at the Who Pays Writers data; the second part will be all about the implications of those findings and bring in some outside data on writers across the country. But both will be used to answer the ultimate question: Can you survive as a full-time freelance writer in 2016? 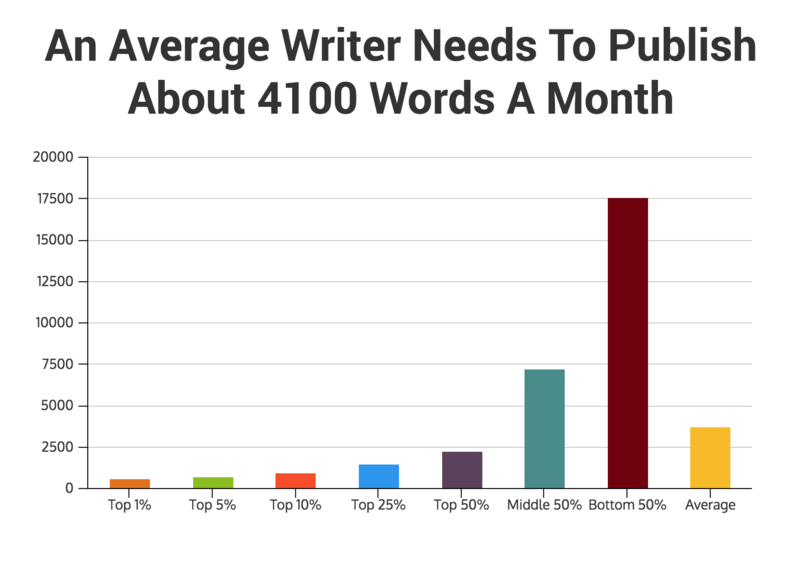 The Top 10% of writers have it extremely well, making more than four times the average pay of $.30 per word. 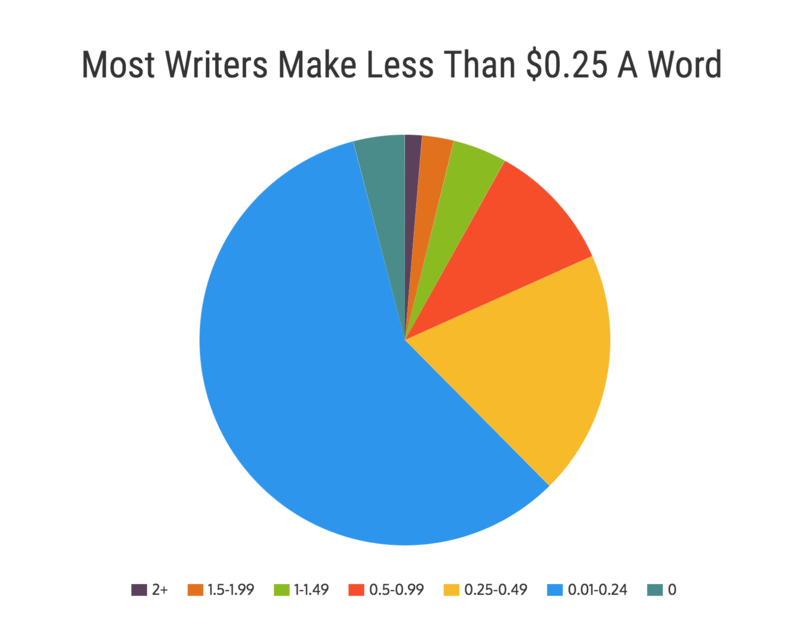 But as we move towards the Bottom 50% of writers, it becomes a little more disheartening, with the top half of the sample of writers making eight times more per word than the bottom half. Just like many other professions, to really make a great living you have to be at the top. That belief is even more prevalent and obvious in freelance writing. 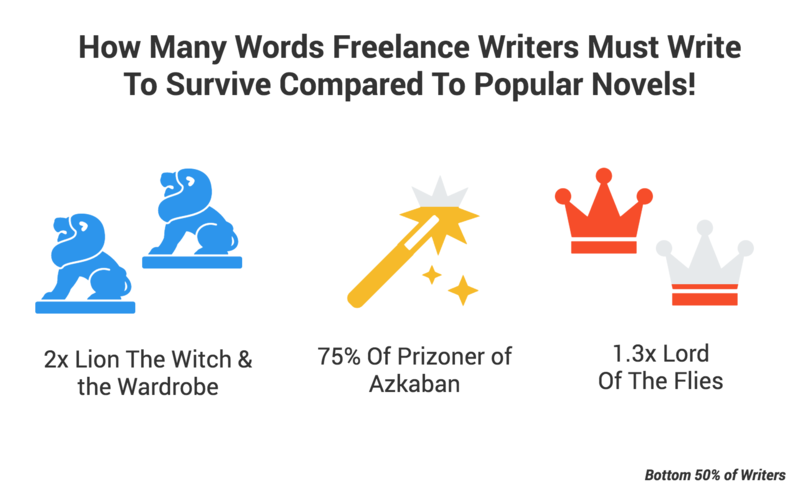 There are a few out there can afford to make freelancing their sole source of income, but again, they are the only really the Top 10% of writers. But honestly, most will not make enough for it to be a longtime legitimate career choice. But we will get deeper into that in the second part of this article. Now on to the Pay Per Article data, which paints a similar picture of a struggling freelance writer. We will start with averages: the average pay per article being about $380. And again, this was extremely top-heavy, over 76% of writers making less than the average. 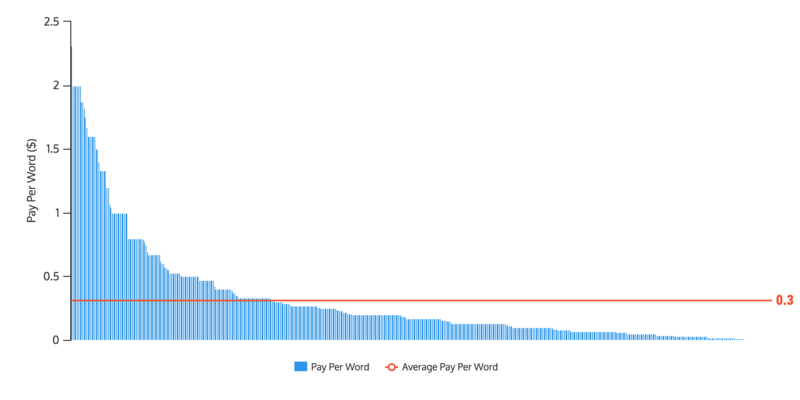 It may look very similar to the Pay Per Word graph, but the point at which payments drop below the average happens a bit sooner. 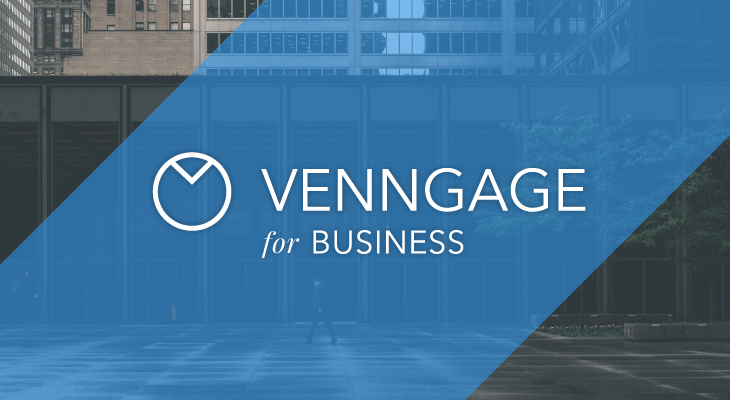 Just like with Pay Per Word data, we broke the Pay Per Article data into manageable segments. 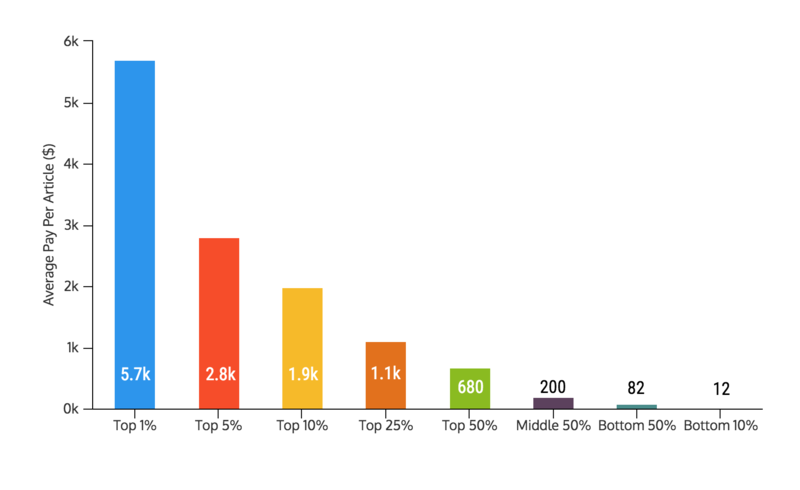 It was quickly apparent that it was even more top heavy than we expected, with the Top 1% making more than double per article compared to the Top 5%. 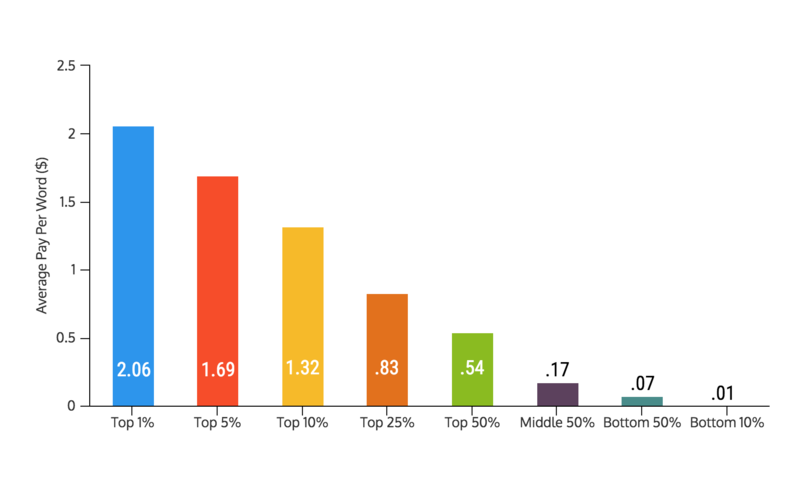 This shows that there is some income inequality even at the top! 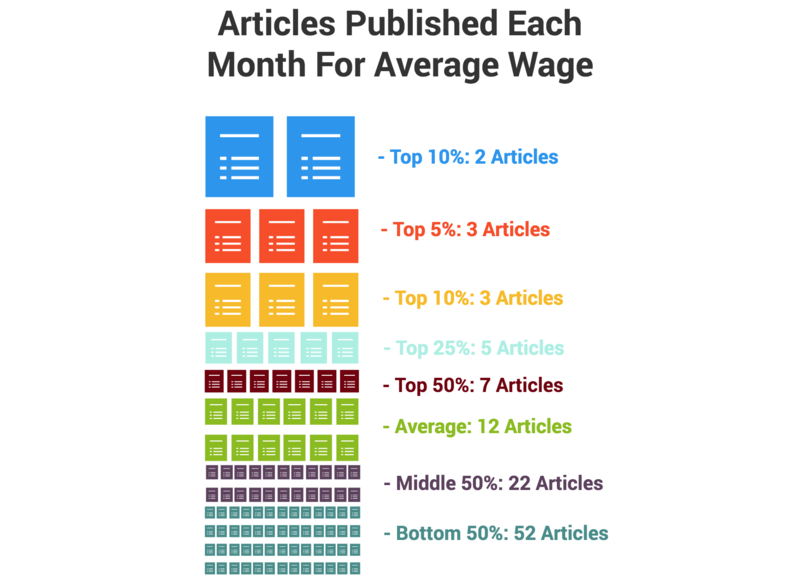 In this case, the Top 10% earned five times more per article than the sample average and three times more than even the Top 50% of writers–although, in this case, the difference between the Top and Bottom 50% was a little closer. 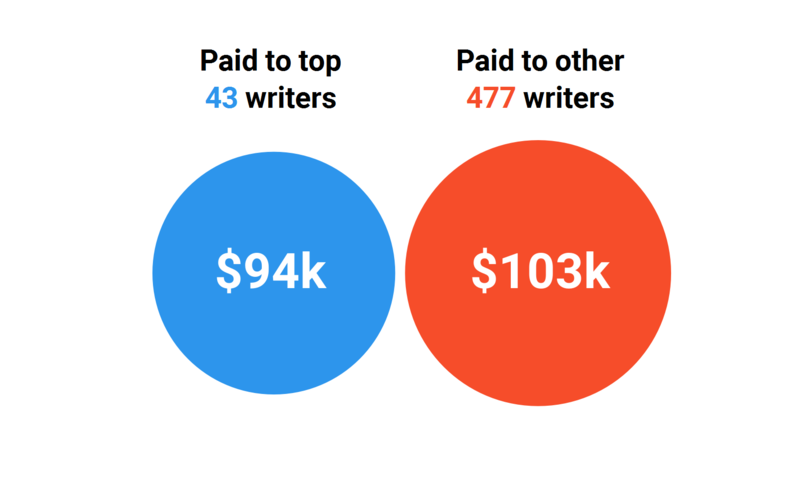 The top half of writers made a bit over three times more per article than the bottom half. And finally, the Top 10% of writers made almost a 160 times more than the Bottom 10% and 24 times more than the Bottom 50% of writers. To further show that most of the freelance money stays with the top writers, we broke it down even further. In this case, a majority of the writers do not make more than $250 per article and most make less than a $100. 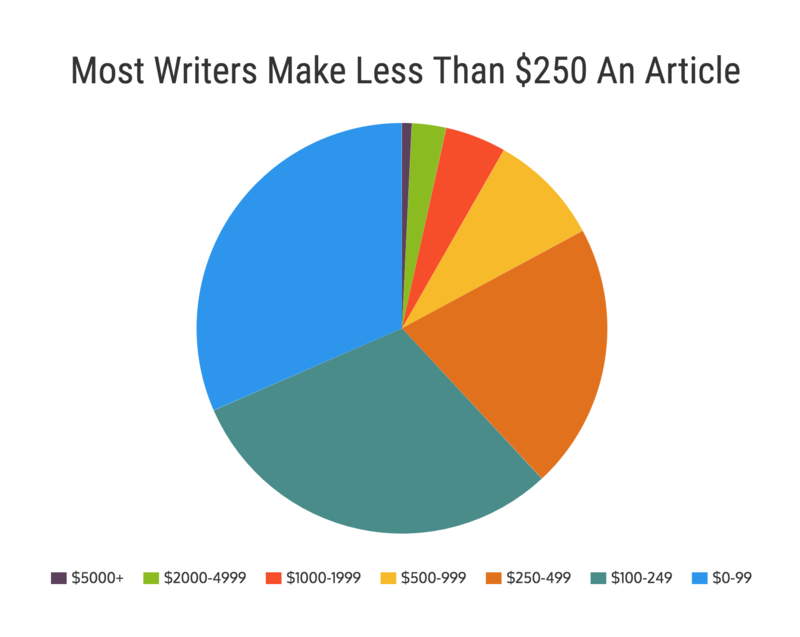 Those making under $250 per article make up 62% of the sample, and those making less than $500 make up over 83%. This is yet another finding that shows a majority of the freelance writing money is made by the few. At the top, there were 43 writers that made more than $1000 per article and the other 477 making under $1000. When the total pay for both groups was added up it was a lot closer than you would think. 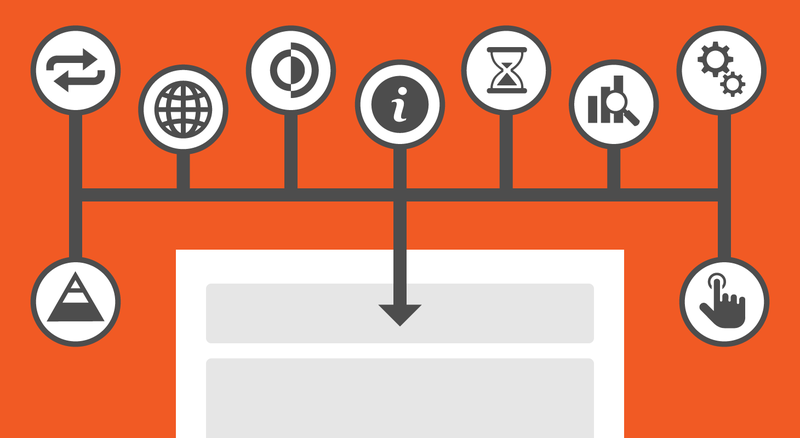 From what we found directly above, writing longer articles should make more money online. But in some cases, that is not entirely true. We found that the average length was a reasonable 1400 words. If you are having trouble visualizing that, it is about the length of this article up until this section. 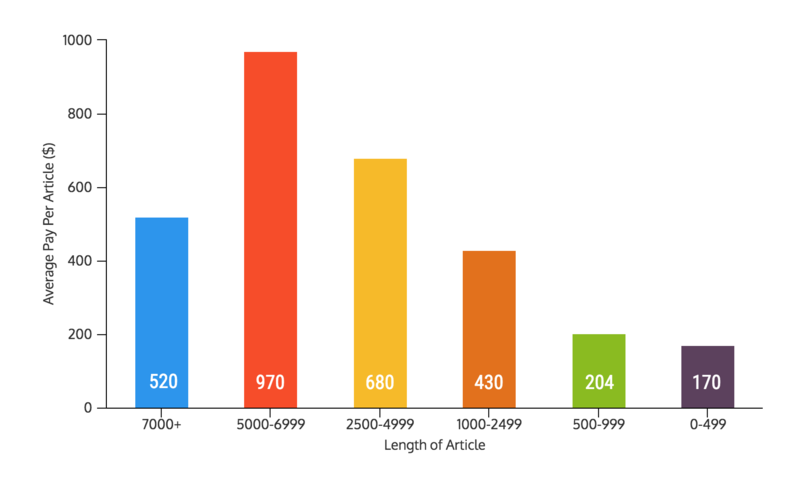 In fact, 54% of articles are less than 1400 words long, so the average is very true to the sample. But those fears we quelled by comparing both the increase in pay and the increase in word count for each effort level. As the effort increased, the Average Pay also increased at a very steady rate of 68% and 87% for Little to Medium and Medium to Heavy, respectively. There was, however, a disparity between the same range for Average Length only increasing 17% from Little to Medium but 84% from Medium to Heavy. We believe the small increase between Little and Medium effort was caused by people selecting Medium out of habit. As you can see in the pie chart above, more than half of the sample selected a Medium level of effort. 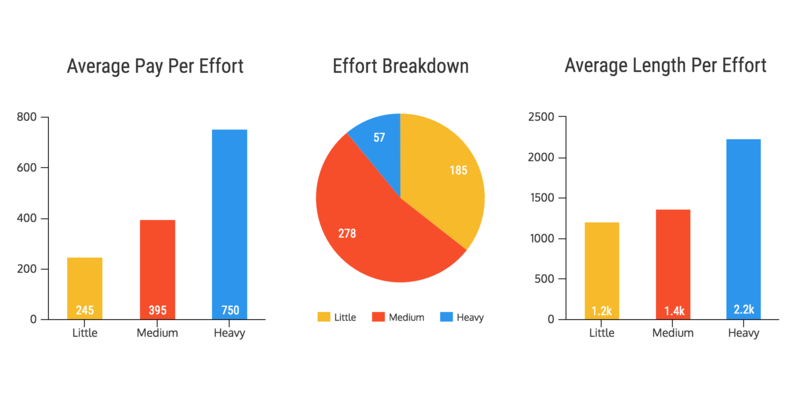 Not many people want to admit that they put little or no effort into a project or article. Finally, as a thought experiment, we decided to arbitrarily assign hours expended to the different levels of effort. They were estimated and assigned as 10, 15 and 20 hours for each level, respectively. Based on that established criteria, we found that putting a Heavy level of work into an article was still the most fruitful, earning almost $38 per hour. And you could work for almost 10 more hours on a Heavy effort level article before it became more lucrative to give Little and Medium effort. Plus an article with Little effort would have to drop down to only 6 hours spent on an article to be worth it in the long run over a Heavy article. Again, this is just a thought experiment, but it could be useful when planning out an article or project! 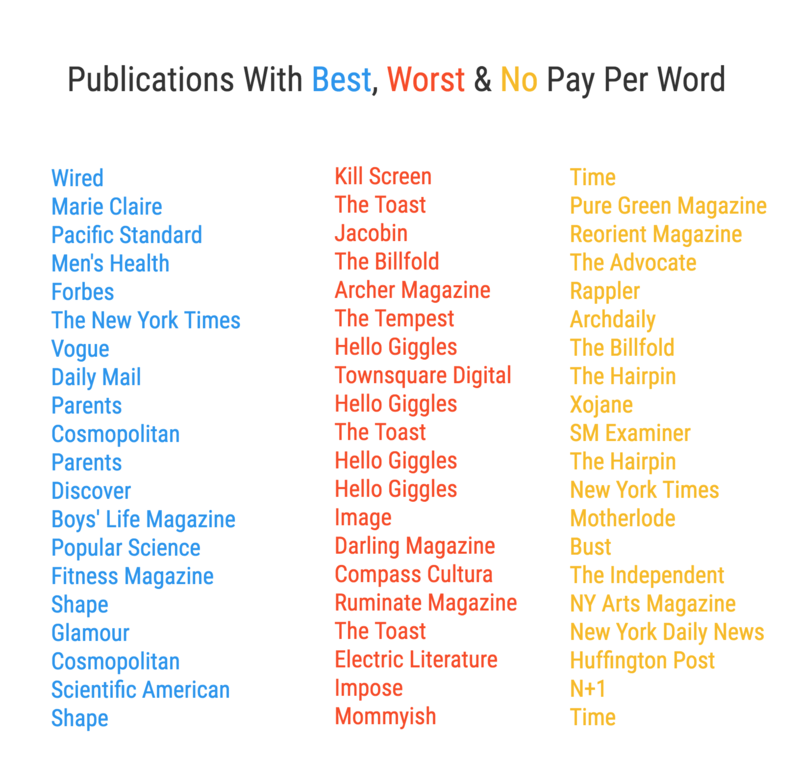 The publications with the best payment per word ranged from $1.50 per word at Shape to $2.31 per word at Wired. At the lowest point, that group of publications still paid five times more per word than the average. To put that into perspective, the pay per article ranged from $200 for an extremely short article to $8000 for the top paid article in this group from above. That top paying publication last year was Popular Science. 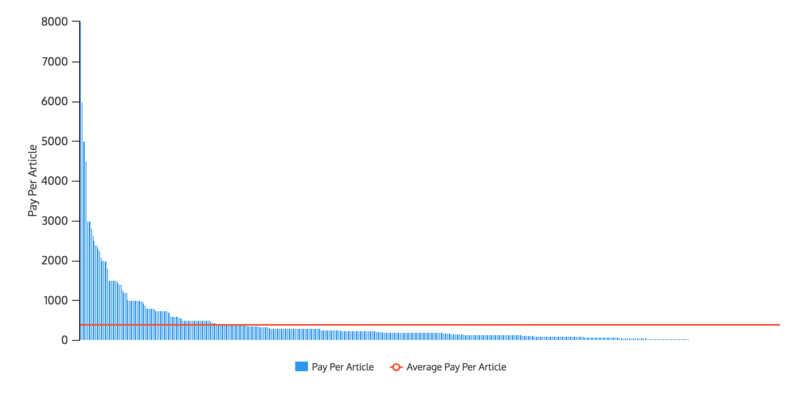 The average pay per article was a high $2500 per article (six times more than the average pay per article from our sample). But do not expect to hit this high a pay when you’re starting out. Just like any other profession, it takes a few years to move up in pay. In fact, when we looked at the top 50 publications in pay per word only 6 were facilitated through a cold pitch. A majority were written based on an ongoing relationship or assigned by an editor. 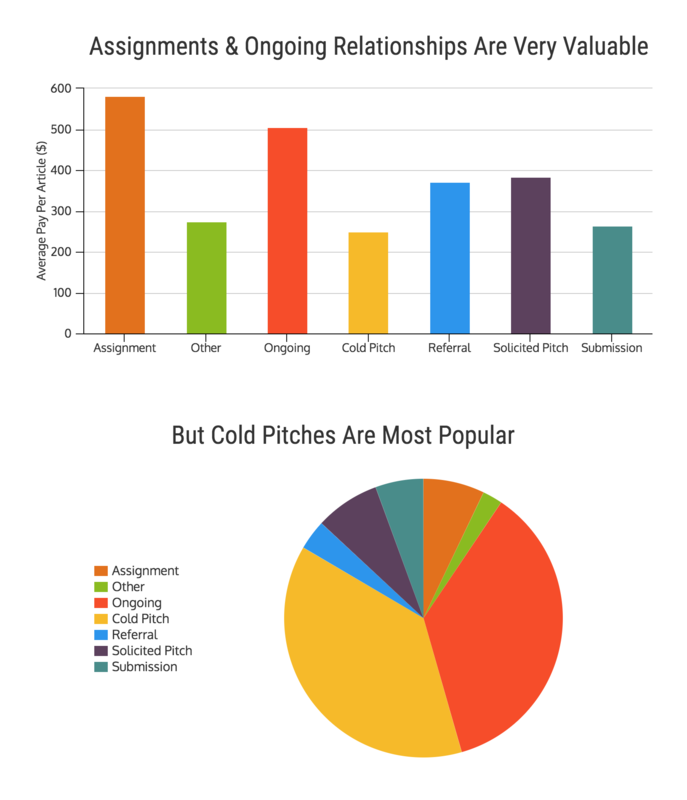 But as you move towards the bottom of the pay per word scale the frequency of cold pitches and submissions increases dramatically. To make just the minimum wage, approximately $1230 per month, an average writer needs to publish almost exactly 4100 words per month. Again, this is not just writing 4100 words; those words have to be published and the writer actually has to be paid for this effort. And for the Middle 50% of writers, that number jumps up to almost 7300 words that must be published per month. 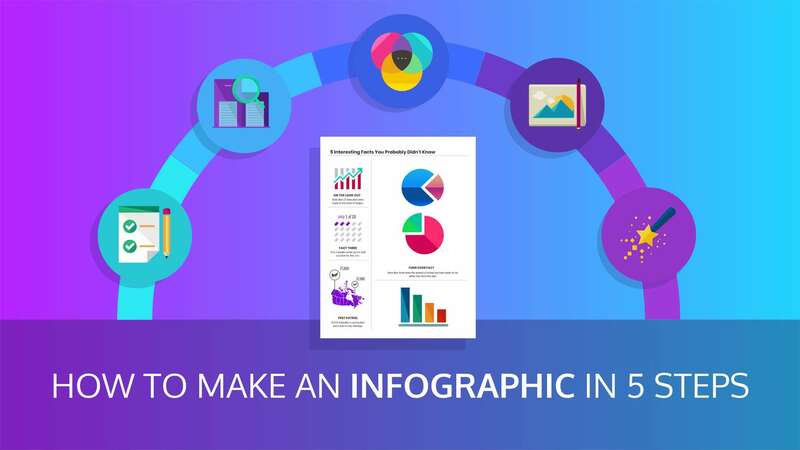 We can also break it down based on an article count as well, which translates to roughly three 1400 word articles per month for the average writer. Those publishing estimates may not seem like much but it is still a ton of work just to make the minimum wage each month. According to a study by Contently, almost 40% of their freelance sample made less than $10k last year. And even worse, 23% of full time freelancers made less than $10k in the same time span. The minimum wage gives employees an income of about $15k per year, give or take a few thousand dollars depending on the state. But if those findings from Contently correctly represent freelance writers, about one in four freelance writers earned less than minimum wage last year. Contently’s findings on the medium income for freelance writers put it firmly between 10k and 20k for all freelancers. This gives more credence to our belief that a large chunk of freelance writers made less than minimum wage for their efforts. 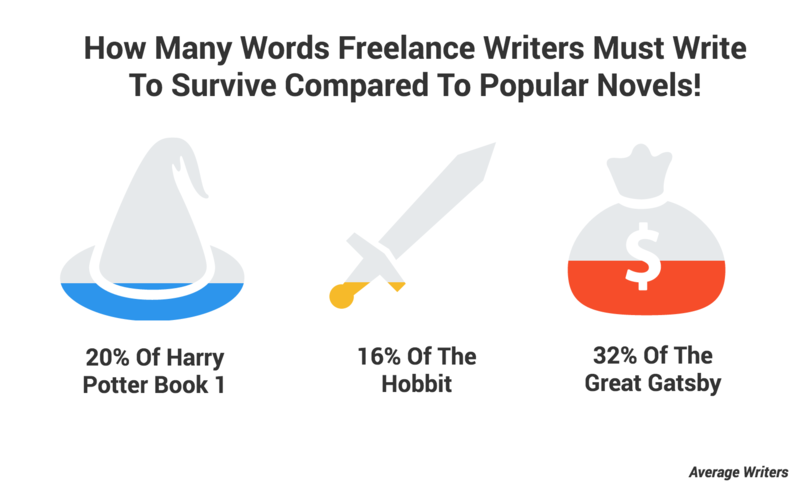 To be honest, those are not promising statistics if you are looking to become a freelance writer…and in the next section things will look even worse. For the top writers, this means publishing a modest 3k to 6k words per month. In fact, for the top 50% of writers, the word count required for each month does not exceed 10k words, at any wage. Those are all very reachable goals for a driven, full-time writer. That only requires about seven or eight 1400-word articles a month–at the most. Or two really long articles, like this one! For an average writer that makes $0.30 a word, the requirements are still not that steep. But again, that average is a little top heavy, just like any other estimate on wages. For those average writers, they would need to publish between 8k and 15k words per month. Or at the maximum, twelve of the 1400 word articles a month. Again this is a very reasonable goal for a driven writer. The required word count does not start getting out of hand until we look at the middle 50% and Bottom 50%. 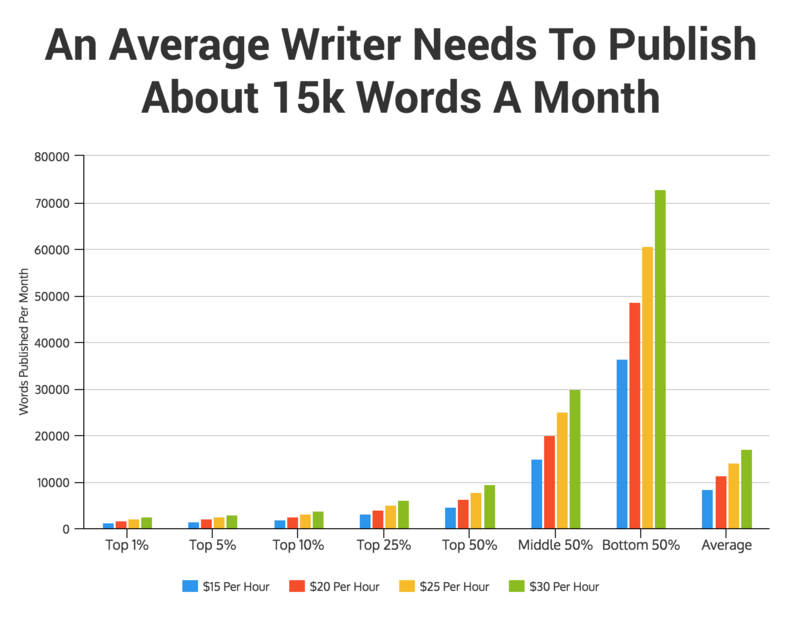 For the Middle 50% of writers, they would need to publish between 15k and 30k words a month to earn the average wage. Or between 1k and 2k words published per day. We are guessing this is where a majority of the writers are concentrated which makes the number even more concerning.